Yesterday, Cuts Hurt took its first step publicly to paint the real picture of the devastation underway because of the cuts unleashed on the people by Liberal state premiers. 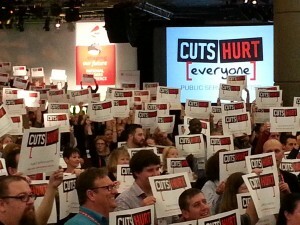 Yesterday, we explained that those cuts hurt everyone. It’s worth another closer look today. One way of thinking about this is comparing the actual cuts to the what those cuts actually mean in the your daily life and the lives of the hard-working people in the public sector. • Prime Minister and Cabinet = 40. What has been the impact on services so far? have been postponed, including the internationally significant National Aboriginal triennial. So, that’s one way of looking at the direct connection between cuts and services. Once the smoke of misdirection clears, you can pretty much see the truth. John Howard may have gone off message—or least, Tony Abbott panicked enough about Howard’s call to go back to the pre-Fair Work days that he, Abbott, hurried to say, “oh, no, that was back then, we’re not for that”, even though he refuses to say what exactly he is planning when it comes to workers should he become prime minister. But, we know exactly what is on the mind of Abbott because his ideological sidekicks in state governments offer a pretty good roadmap. AT LEAST 80,000 NSW public sector workers are set to lose salary benefits and conditions under sweeping cuts to their awards. The O’Farrell government yesterday confirmed it had applied to the NSW Industrial Commission this week to change 98 awards for public sector workers, including 1000 nurses who assist people with disabilities and those in aged-care facilities. Clerical staff, librarians, parks and gardens staff, school administration assistants, regulatory inspectors and legal officers are also among those set to lose their entitlement to long-held conditions, including an annual leave loading of 17.5 per cent. The government also plans to cut penalties for all shift workers and allowances for staff stationed in remote areas. Some sick leave entitlements, flexible work arrangements and parental leave would also be affected by the changes. Add to that the drip, drip, drip of job cuts O’Farrell is imposing and the picture is crystal clear. NSW Public Service Association’s General Secretary John Cahill terms O’Farrell’s plans “a disgraceful further attack on the public sector workers”. What Abbott is trying to avoid are the details of what he will do because it is no coincidence that O’Farrell’s popularity has slid—people don’t like losing their jobs, and, actually, they don’t like hearing that their family members and neighbors are going to be axed, either. Sometimes, the forest is hard to see when you get confused by the trees. And speaking of forests and trees: with the slashing of 120 Rural Fire Service jobs, the public sector has now taken a hit of more than 1200 regional workers—people who won’t have a decent paycheck or benefits or security. The NSW Government’s agenda of quick and deep public sector job cuts is tearing apart the fabric of our regional communities.Not even vital regional services like the Rural Fire Services, Office of Water and Crown Lands can escape the budget razor. And here is something worth taking a peek at. 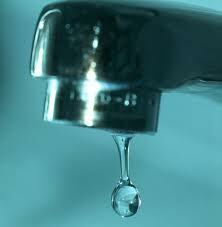 The drip, drip, drip of job cuts imposed by Barry O’Farrell is, perhaps intentionally, not being rolled out at once. Rather, it’s a cut here, a cut there—not big enough for the public to see the big picture. And if you look even further down the list, you can see what still is yet to come: thousands more jobs on the chopping block.